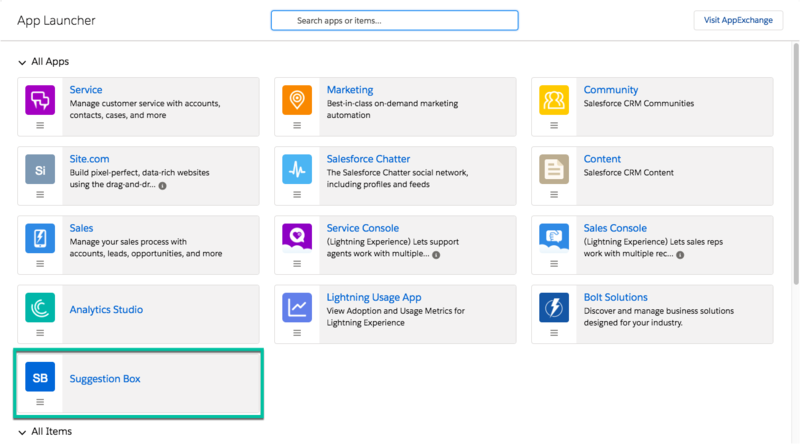 Salesforce has two different desktop user interfaces: Lightning Experience and Salesforce Classic. This project is designed for Lightning Experience. In this project, you learn how to build an application on the Salesforce Platform from start to finish, without writing any code. If you're new to the Salesforce Platform, the goal is to introduce you to the basics of app building. These point-and-click skills apply whether or not you plan to write code on the platform. If you're familiar with the Salesforce Platform Admin features—managing users and security, customizing standard objects, and so on—the goal is to apply those skills to developing new applications. You need a free Trailhead Playground or Developer Edition org to complete this project. You can find it at the bottom of this page. 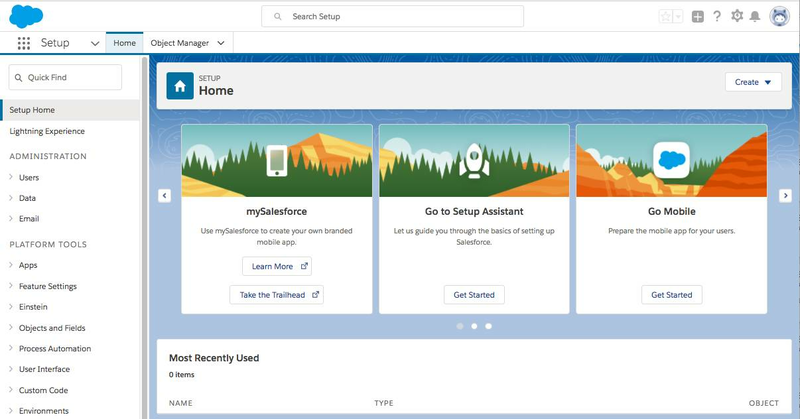 Click Launch to open the Trailhead Playground in a new browser tab (login required). You will build a suggestion management app that allows employees to submit suggestions and track their status using these steps. Create the app definition and a data model for the application. This simple application requires only one custom object. Modify the user interface on the browser and on the Salesforce mobile app using page layouts, compact layouts, and global actions. Automate calculations, data quality, and database updates to improve the user experience using formulas, validation rules, and a process builder. Define reports, charts, and dashboards to track the status of suggestions and analyze how well the company manages suggestions. Note: Instead of creating a Suggestions custom object, you could use Cases, a Salesforce Service Cloud standard object. But in this example, we want to explore building a custom app without using Service Cloud. Create a Salesforce app that includes standard collaboration and analytics features. Familiarize yourself with the app’s user interface in the browser and in the Salesforce mobile app. If you haven’t already, log in to Trailhead, then launch your Trailhead Playground by clicking Launch at the bottom of this page. Make sure you switch to Lightning Experience to complete this project. If you haven't yet enabled Lightning Experience, do that now. In your Trailhead Playground, click the icon and select Setup. Before we move further with creating an app, let’s create an object Suggestion. Click Object Manager tab next to the Home tab. Click the Create dropdown at the right side and then select Custom Object. Now create a custom tab. Click the Home tab, enter Tabs in Quick Find and select Tabs. Under Custom Object Tabs, click New. For Tab Style, select any icon. Leave all defaults as is. Click Next, Next, and Save. From Setup, enter App Manager in the Quick Find and select App Manager. 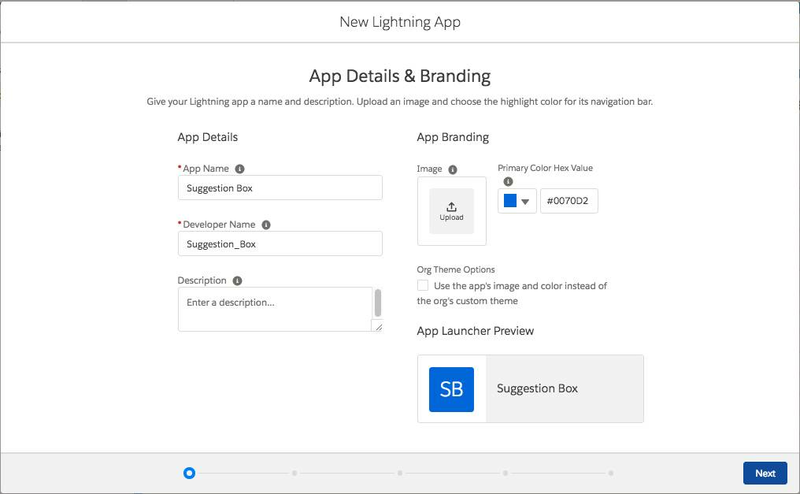 Click New Lightning App, enter Suggestion Box for App Name, and click Next. Leave Standard Navigation selected, then click Next. From Available Items, select Suggestions, Reports, and Dashboards and move them to Selected Items. Click Next. From Available Profiles, select System Administrator and move it to Selected Profiles. Click Save & Finish. To verify your changes, click the App Launcher and select the Suggestion Box app. App Name—Displays the current selected app. Navigation menu—Displays the tabs available inside the app. For this step, we'll use the last option. 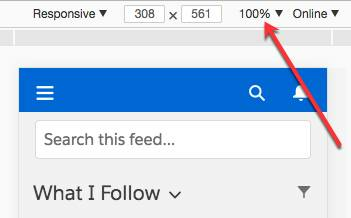 Click the Toggle Device Mode button to simulate your browser as a mobile device. If the display is too small, change the size to 100%. Click the icon to open the left navigation bar. Find the Suggestions object under Recent. You may need to click More to see it. Click Suggestions to display your recently viewed suggestions, if you have any. Click New to create a suggestion. 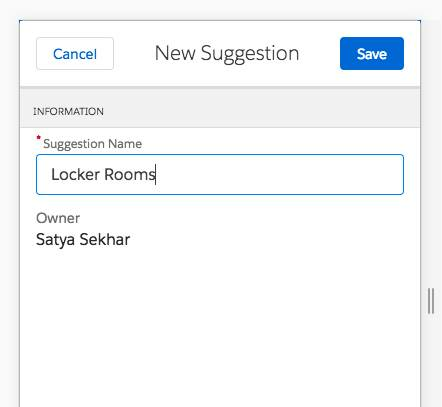 Enter a sample suggestion (maybe something like "Locker Rooms"), and click Save. With just one button click, you're on your way to building a mobile app!